Start at the PlayStation 4's Dynamic menu. Press up to go to the Function bar (at the top of your screen). Scroll to Network and press X. 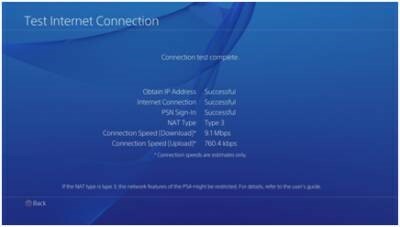 If the test shows your connection as NAT Type 3, communication with other PS4 systems might be impossible, or you may encounter problems connecting to the network. Turn off your PlayStation 4 and your Modem/Router and wait for 15 - 30 seconds. Turn on your PlayStation 4 and test the connection again by following the steps at the beginning of the article. If this does not solve your issue, try placing your PlayStation 4 in the DMZ of the router or establishing a direct connection to your modem (where available) and retry.